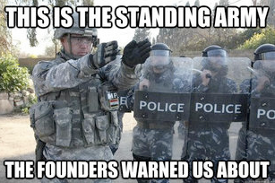 The Founding Fathers Fought the Revolutionary War to Stop the Type of Militarized Police We Now Have In the U.S. The same search yields thousands of images. A comparison of photos of soldiers in war zones in Iraq and Afghanistan and police in Ferguson shows they are virtually indistinguishable. Remember, the Founding Fathers repeatedly warned against standing armies. Of course, it would be bad enough if the militarized police forces were only used in genuine emergencies. But Balko notes that the authorities have become “very antagonistic toward the very idea of free speech and the First Amendment“. And militarized swat teams are being used against people who commitcopyright infringement … or credit card fraud. They’re being used “for routine warrant service in … nonviolent crimes“. SWAT teams today are overwhelmingly used to investigate people who are still only suspected of committing nonviolent consensual crimes. Interestingly, 3 times as many American colonists supported King George of England during the Revolutionary War as support our own Congress today.